“Nothing about the CFIA would surprise me”, said Karen Selick, in a comment on a recent post on The Bovine. Well, here’s another case in point. Why should different, and higher, standards apply for meats being exported to Japan, than for meats sold to Canadians? Do Canadians not matter? Are Japanese export customers more important than Canadians? Is that what the CFIA was thinking? For those who might have wondered, when they read the story in the media a few months ago about the massive recall of meat from XL Foods in Brooks, Alberta, how such a thing could happen in a plant where 40 some CFIA inspectors are on the job, the memo described in the story below may be the answer. However, the report on this scandalous memo is not exactly as “out there” as the original recall story. Merely a few column inches on page 3 of today’s paper. “Federal beef inspectors were told to ignore contamination on carcasses being processed for sale to Canadians at the XL Foods plant. A memo from a Canadian Food Inspection Agency (CFIA) meat hygiene supervisor obtained by CTV News instructed CFIA inspectors to closely examine carcasses being processed for shipment to Japan, but to ignore visible contamination on meat for Canadians. 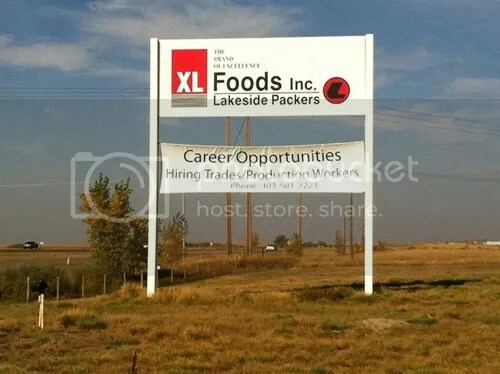 XL Foods plant in Brooks, Alberta. Photo via Calgary Sun. Click image to go there. “At each stage, the E. coli sneaked through. It came in with the feces caked on the hide of at least one cow, a so-called “super-shedder” of bacteria, and persevered. The E. coli wasn’t caught on the kill floor, survived cleaning and clung on during dehiding, in which a cow’s skin is peeled away. 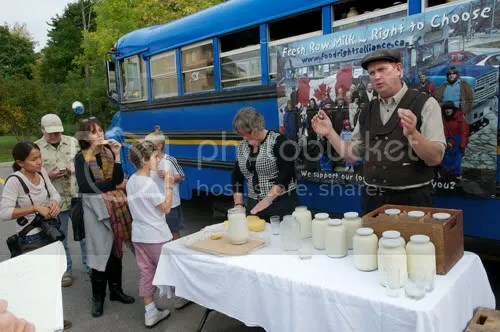 Danielle Smith speaks up for the “conscience rights” of Alberta civil servants; raw milk anyone? UPDATED! 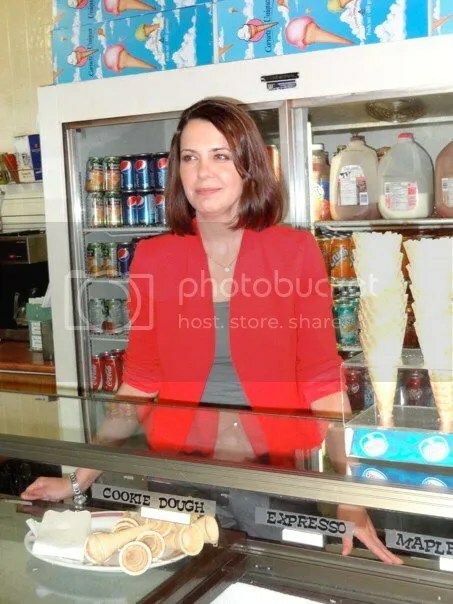 Danielle Smith, from a recently photo op in an ice cream store. Photo via Danielle's Facebook page. The following quote is taken from a newspaper story by Warren Kinsella, in the Calgary Sun, that’s in general harshly critical of the views of Wildrose Alliance leader Danielle Smith. Danielle’s party is a strong contender in the upcoming Alberta elections. Lisa Lundgard from Peace River Alberta was in town for the rally Nov. 23rd at Queen's Park. Lisa grew up on pasteurized milk until her parents met Sally Fallon when she was in Grade 9. 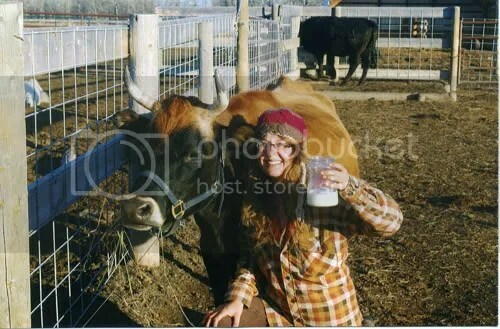 She’s been happily drinking raw milk now for 10 years. That’s her cow Sassy, in the picture. Thanks to Lisa for the photo. Lisa has been visiting for a week at Glencolton Farms in Durham. Agriculture has been the backbone of Canada. History has taught us that a healthy Agri-culture is able to feed all the people and therefore creates a healthy and socially stable enviroment. At the turn of the last century 70% of our Canadian population was actively involved in farming. Today we have only 2% of the poulation left working on farms and 80% of them have to have another job to keep their farm going. The average age of today’s farmers is 56 and hardly any young farmer can afford to start farming. Corporate farming has taken over food production and multi national corporations control most of the farming inputs, food processing and distribution.